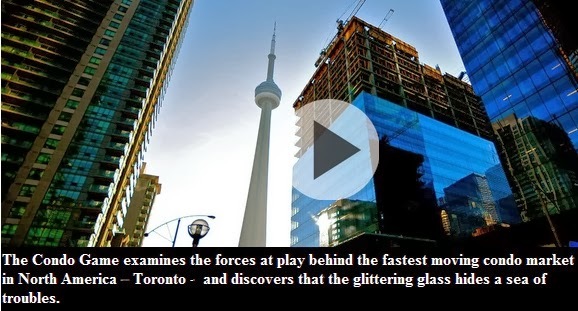 The Condo Game documentary that aired on CBC this past Thursday focuses on how condo developers rule the city and how city planners have almost no say in how Toronto grows. The development industry sets the standard and not the city, said Chief City Planner Jennifer Keesmaat. Additionally councillors tend to side with developers as they contributed $8 million towards both Liberal and Torie campaigns. Just few days ago, councillors approved new condo plans for Eau Do Soleil condominiums on old beach model lands. Councillors did so against city planners recommendations. In fact, the planning staff urged councillors to refuse the application. There reasons were that the proposed condo did not meet a number of criteria in the Official and Secondary plans, nor does it comply with the heights and setback requirements outlined in the Etobicoke Zoning Code. The application by the developer can be viewed here. Finally, here's an excellent bonus clip from the Condo Game where David Fleming compares buying a pre-construction condo to buying a cake.